Watched this film yesterday, on the recommendation of a person who's judgement I trust. Also, it gets a pretty high rating from IMDB and Rotten Tomatoes. What I realised is that like many great movies, above all, what makes this film great is it's study of the composition of the three main characters. "The Good" (Eastwood) and "The Bad" (Van Cleef) are consistent in their behavior; fair and ruthless respectively - they are interesting elements. 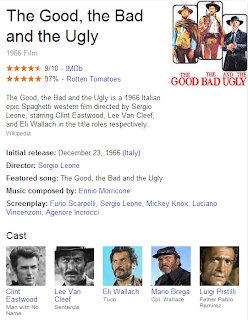 "The Good" is essentially a Spaghetti Western version of "Robin Hood". "The Bad" is simply a complete psychopath. 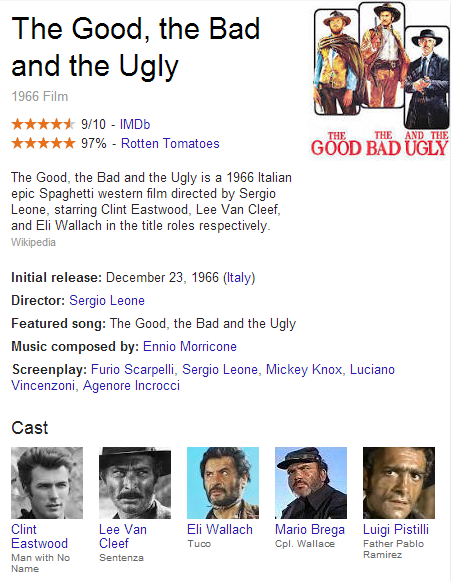 By far the richest and most interesting character is "The Ugly" (Wallach) - AKA, "Tuco". Tuco is vengeful, confused, greedy, clever, frustrated, skilled, brave, passionate, conniving, cowardice and empathetic - the list goes on. Despite this tangled mix of characteristics, as a character Tuco remains uncompromised and believable - he is essentially a survivor. Tuco is seemingly suspended between the hard lines of the other two key characters (Bad and Good). In-fact, it is my opinion that Tuco is a close-to-ideal study of what it is to be human. Most of us (at least most people I know) tend to swing from being the best we can be, to being...how can I say this...more "relaxed" with regard to our own moral standards. Sometimes we do our best, sometimes we could do better. I think that this is part of what being human is about - the environment we find ourselves in regularly (often unpredictably) challenges our intellect and our moral aspirations. An observation that I have made of life; it seems the more we relax our own moral standards, the higher the stakes of the intellectual and moral challenges we encounter become. A potential corollary of this observation is - the more we relax our own moral standards, the luckier we need to be in order to survive. Tuco is perhaps the portrayal of a person who is more relaxed about his own moral standards and is subsequently more "challenged" than your average Joe. He is certainly a very lucky character.